The Zayliyskiy Alatau (also sometimes spelled Zaylyiskiy, Zailiiskii, or Zalisky) is the most northerly part of the Tien Shan, and the Tuyuk-Su subrange—the mountains around the Tuyuk-Su Valley—are easily accessed from Almaty, Kazakhstan’s largest city. Near the entrance to the valley lies Chimbulak (Shymbulak) ski resort. It’s my home range: I work as a mountain instructor and also climb there for fun. The highest mountain in the valley is Ordzhonikidze (4,410m, 43°3’24.68''N, 77°6’45.71''E Google Earth). 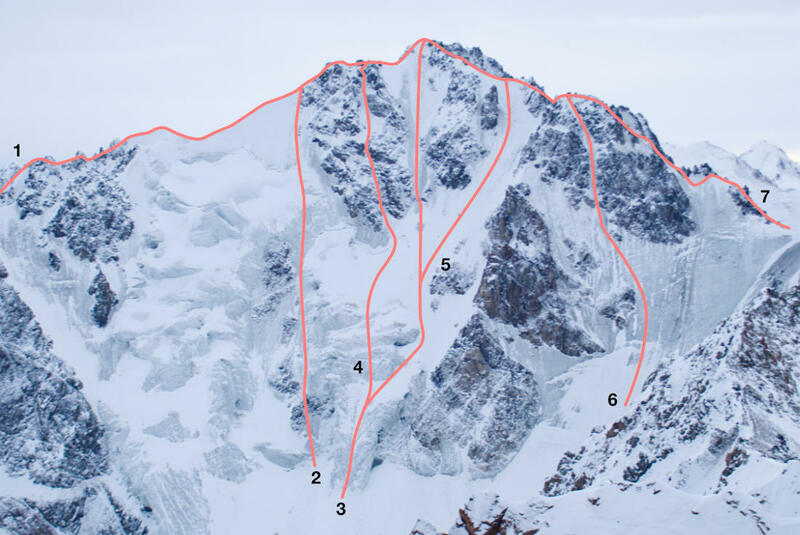 In June I soloed a new route on the north face, and then in December I returned with Grigory Schukin and added another route, the hardest to date. There are no walk-downs from the summit of Ordzhonikidze. The easiest route is Russian 2B or French PD. On the icy north face were three existing routes, the first by Alexander Kolegov’s team in 1956. Much later, Vassily Pivtsov and various friends added two more, in 2000 and 2004. All these were 4A or 4B. The Ordzhonikidze Glacier below the north face flows into the next valley east of Tuyuk-Su. I climbed the north face for the first time in 2014. 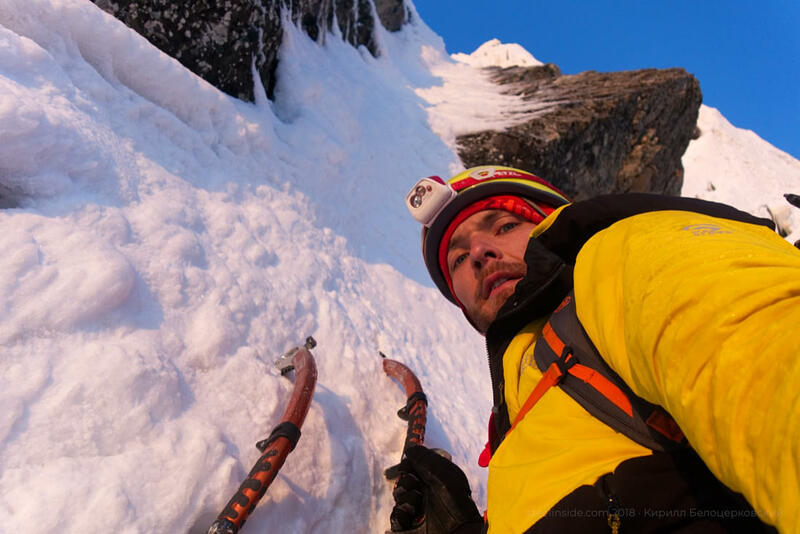 Pavel Gryaznov and I climbed simultaneously, placing one ice screw per rope length. This is totally unacceptable from a safety point of view, especially if you take into account that some of our screws were 10cm stubbies and the ice was pretty soft. We climbed a direct route, similar to the Kolegov, in two hours and 14 minutes. Hey, I thought, soloing would be faster and even less dangerous, because there would be only one person who could make a mistake. I had been playing with this idea every since Pavel and I got down off the route, and last summer everything worked in my favor. I had a gap in my work schedule and the weather was, well, not that bad. I started from Tuyuk-Su camp during the afternoon of June 8. I reached the Manshuk Mametova Glacier in thick mist and light snowfall, and from there planned to cross Antikainen Pass to reach the Ordzhonikidze Glacier. But with “ping-pong ball” visibility and lots of wet snow, I decided it would be safer to approach via the west ridge of Antikainen 4,000m. For the next couple of hours, I scrambled up the rocky ridge. Upon crossing the summit, the weather cleared slightly and I felt a bit safer descending the snowy slope toward the Ordzhonikidze Glacier. Not far from the north face I spotted a hollow in the snow below a big boulder. As I had not brought a tent, only a sleeping bag, this seemed a good place to stop for the night. I set off next morning at 5 a.m., opting to climb a new route on the left side of the face. Fifty meters of steep snow led to a 30m rock band split by an ice gully. After climbing the gully, I raced up snow slopes beneath the seracs. The upper part of the face was covered with a thick layer of loose snow. In some places, I had to dig down a meter to get to ice. Due to this, I spent around four hours climbing the face and reached the northeast ridge totally exhausted. I followed the easy ridge for 200m to the summit, where I called my wife to tell her I was fine. After only a little rest, I headed down the rocky south ridge leading to Partisan Pass. From there a couloir descends to moraine. Depending on conditions it can be ice or snow: I was lucky and simply walked down steep snow. From the moraine it took two hours to walk to Tuyuk-Su camp. The total length of the route is 1,000m at an overall grade of 4B. 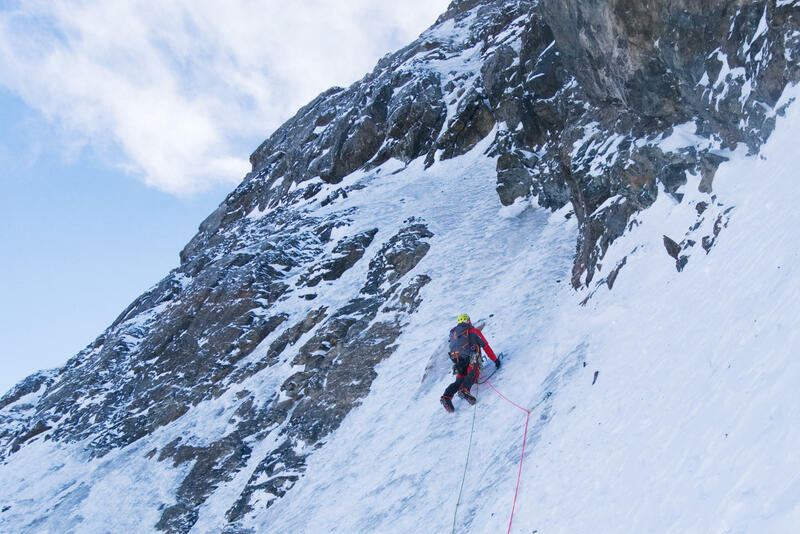 The steepest ice is around 70°, and there is easy mixed climbing in the lower part. 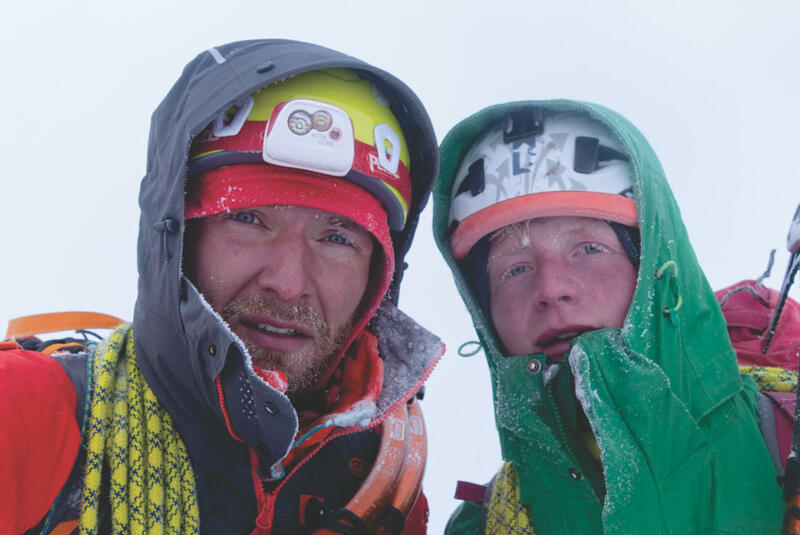 In December I returned with Grigory Schukin and climbed another route. This time we camped at Ordzhonikidze Pass, and on the morning of the 26th walked down to the base of our proposed line, which started up the 1956 Kolegov Route then climbed more or less directly through the previously untouched mixed rocky area to the left. It took 10 hours to reach the northeast ridge and a further 30 minutes to gain the summit (overall grade of 5A). We descended the northwest ridge toward Ordzhonikidze Pass and eventually regained our tent at 7 p.m. The weather was cold and windy (around -20°C), and when we reached the mixed section at 10 a.m. spindrift avalanches started to affect us. By the time we reached the summit it was a whiteout.